Sometimes cross-sales fall in your lap. Most of the time though, you have to work hard to make it happen. I’ll assume you’re already good with the ones that fall in your lap, today I want to give you a bunch of ideas for making cross-sales happen. 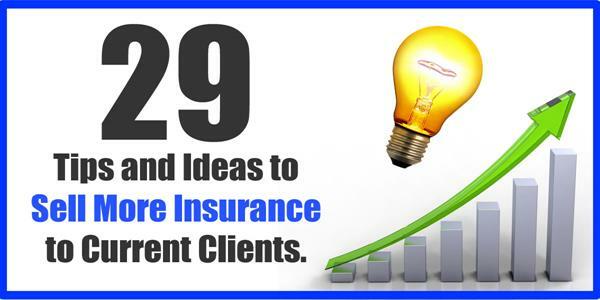 So I did a little “brain-dump” and came up with 29 different ways you can cross-sell more in your insurance agency. If you get an idea or two please share this resource with a colleague and if you have ideas to add let me know in the comments below. Did you know there are two distinct types of Cross Selling situations? Prospects who already own the product - These people already bought the coverage from a competitor but you’re trying to get the business with your agency. The key with them is repetition, collecting the x date, good follow-up and selling the benefits of your agency. Prospects who DO NOT already own the product - These people don’t currently have the type of coverage you’re trying to sell them. The key with them is product awareness, education, creating a need, identifying interest, and then selling. These aren’t complete opposites, but they do require different approaches and sales tactics. If you’re currently treating all cross-sale prospects the same, take a few moments to think about how each one requires a different approach and how you can address it best. It’s great if you read my articles and get a few ideas to implement here. That’s why I write the darn things. The trouble is that most agents “think” they’re going to use a few new ideas, some of them really do, but very few make changes to the procedures and systems they use in their agency to make process improvements last. The only way to create lasting success is to establish formal systems for processes in your agency like cross selling. And this article is the perfect resource to help you put something like that together. Use it and do it! You don’t have to write a manual, just make a list of what you want to do in each of the most common situations and share it with your staff. Assuming your agency doesn’t specialize in specific lines of insurance, there are probably at least 4 different products that each of your customers could also buy from you. And there are probably a bunch more that aren’t even relevant to each client. Find a way to prioritize the best products to cross-sell each client and get this information front and center for your sales and customer service folks. If your plan is to remember which products are the best cross-sale opportunities for each client, or to just always cross-sell the same one or two lines to everyone you’re not cross-selling efficiently. Ideally, you’d be able to pull up any of your client’s accounts and see, at a glance, what products are the best cross sale opportunities for them. Having information like this top of mind when you’re looking at a client’s account will make a huge impact in how often your salespeople bring up the cross sale conversation. In addition, it’s also great if you could pull up a list of all the clients who are prospects for each type of insurance. This is helpful for email, direct mail, or other campaigns that are oriented around awareness of your different product lines. While we’re at it, you’re also going to need a way to keep track of X-dates for each month. Be careful not to push cross-sales too hard during an initial sale. It’s fine to plant seeds, but your prospects aren’t remotely interested in buying a second product from you until they know you can take care of the first one. I’ve witnessed a lot of agents pushing too hard for additional lines when it’s clearly obvious the prospect only has one thing on their mind. Respect your prospect, listen to your prospect, and put their immediate needs first. Pick one person in your agency and put them in charge of getting everyone to cross-sell more. That way someone will always be paying attention to the goings-on in the agency and what could be done to boost cross-sales. There’s also the possibility that your producers will embrace the concept more if it’s not coming from you. This doesn’t even need to be a salesperson. In fact, the person who answers your phones might be the best one! You can give them a little extra commission for all cross sales the agency makes and the first thing they should do is read this article! I get it and I think it can work for some prospects and for some salespeople. But I personally think it sends the wrong signals to push too hard for additional lines during an initial sale and I think it’s better to focus on providing an amazing purchasing experience. It’s a judgement call and you have to do what you’re comfortable with, but remember that once they become your customer, you’ll have plenty of opportunities to follow up for that cross-sale. There’s a reason the Super Jumbo Monster popcorn only costs $.35 more than the kid’s size at the movie theater. People’s minds get set on paying one amount and they’re just not going to dip too much further into their wallet in one purchasing event. So if your life depends on making a cross-sale today, remember you’re far more likely to upsell them a renter’s policy than a life insurance policy. InsuranceSplash readers have all heard this one before because I mention it all the time. Create a one-page flyer that shows all the different products you sell. It doesn’t have to be “salesy” it can just be a checklist. Take every new client through it and use it to guide your policy review conversations. A nice added bonus is that you’ll get more referrals when all your customers know everything you sell! Bonus Tip: Create a page on your insurance agency’s website that serves as the online version of your “everything we sell” sheet. This way you have something to email customers and share on social media. X-Dates, (or expiration dates) are insurance slang for the date when a client’s policy with another carrier or agency is set to expire. The idea is, “if I can’t quote your home policy today let me know when it renews and I’ll reach out to you beforehand”. I see many agents that are so head-over-heels-in-love with quotes, they miss out on cross-sale opportunities being over-aggressive for the quote when they should just be asking for an x-date. Does your CRM let you run audits of your book of business to identify people with one line of insurance but not another? For example, auto insurance clients who own homes but don’t have homeowner insurance from you? Or self-employed people who don’t have business insurance. Parents with children and no life insurance. Most cross-sales don’t happen the first time you suggest an additional line. Most cross-sales don’t happen the second time you suggest an additional line. Most cross-sales don’t happen the third time you suggest an additional line. I could go on… Am I making my point? Some agents argue that every single change your customer make to their policy can be a cross-sale opportunity. I can’t disagree, even if it’s just because the client is actually thinking about insurance for once. But there are certain policy changes that are RED FLAG indicators of a cross-sale opportunity. Back in 2009, I called my insurance agent in Philadelphia to find out if I’d get any discount for becoming a parent. (The carrier I worked for offered such a discount) and would you believe that dumba** didn’t ask me about life insurance? I would have bought it from the first person that asked, and it should have been him. Like anything in life, don’t expect to be good at sales unless you practice. And that certainly includes cross-sales. I wrote an article to help you, check it out. I know some agents that pay LESS commission for cross-sales. Did you know a customer’s retention rate jumps each time you sell them an additional line of insurance? Build incentives into your producer’s commission structure so they get even bigger bonuses for cross-sales than for sales to new customers. Theoretically, producers should prefer cross-selling over other methods since the prospect is usually more receptive but it doesn’t hurt to give them a nudge in the right direction. This is a spin on the one above it about commissions. One of the ideas with cross-selling is that it prevents you from cold-calling. What about driving home that fact by letting producers who make a cross-sale skip out on an undesireable cold-calling activity for the day? It’s a perk, but the real value is the lesson it teaches your salespeople: take care of, service, and upsell your existing customers and you shouldn’t need to work so hard to find new ones. When you’re gathering information to give someone a quote, they don’t know what questions you really need to ask. Use that time to find out everything you need to know about their other policies and insurance needs during the quoting process. What’s that you say? People want their quotes quickly… You don’t have time to ask extra questions? I think this probably works best with life insurance but I’m sure you could use it for just about anything. The basic idea is, you make clients “sign away” their right to a free quote for that other line. There’s nothing legally binding to it, it’s just a conversation starter. Conversation starters are good for cross selling. Do I really need to add this one? I mean, every agent knows the main point of a policy review is to cross-sell. Create a “Mini-Policy Review” for the people who will never take the time to go through your formal review process. Just ask a bunch of quick questions that would allow you to identify a new cross sale opportunity based on any life changes in your customer’s life. Questions like, Did you have any kids, get married, retire, etc? Keep it short and sweet so you can give it to every single customer in your book. Your clients are constantly getting married, having kids, buying motorcycles, starting businesses and lots of other things that can lead to cross sales and I bet most agents are missing 90% of that information. Make a joke, explain how you’re going to, or just give them some information and let them know you’ll talk about it in the future. You don’t have to cross-sell during the initial process, but if you set the stage for it you’ll be glad you did later on. One of the biggest reasons people won’t bring all their lines to your agency is because they don’t see the value. A lot of times you can’t beat the price of their other policy so you better have some benefits ready to give them about why it makes sense to work with just one agency. Here’s a few examples to get you thinking, fewer coverage overlaps, multi-policy discounts, being a preferred customer, easier communication, simpler life, policy reviews that are more relevant, etc. It’s the easiest thing to cross-sell, right? It’s cheap to begin with, many people have to buy it, and it can often get a multi-policy discount on a much more expensive line. So if you’re just getting started with a cross-selling initiative or bringing in a new salesperson have them start with the renters. I’m pretty sure that if one of your customers is on the “Do Not Call” list you’re not allowed to reach out to them about a new line of insurance. However, if that new line of insurance gets them a discount on the line they already have with you… then you’ve got a conversation starter that is focused on a product they’ve purchased from you, which (I’m pretty sure) is 100% legit. If you think this is unethical or illegal then DON’T DO IT. This one’s more for the captive agents. However, cross-sales are usually okay to capture commissions because the money deserves to go to whoever makes the sale. So if you service other agents’ clients in your agency, DO EVERYTHING YOU CAN TO CROSS SELL THEM! Obviously, cross-selling helps you make more money, but it also helps your retention. Because of the boost in retention, even if you only sell one type of insurance it still makes sense to try to cross-sell your clients to another agent in your “network”. If nothing else, when you refer your client to an friend of yours for other insurance lines, it’s less likely another agent will be trying to cross-sell the policy you sold! I know “use social media” should go without saying, but there’s a deeper point I’m trying to make here. I see a lot of agents promoting their “bread and butter” insurance lines on their Facebook pages. But think about this… since most of your followers are probably already customers (I don’t know anyone other than me that follows agencies they don’t buy from) chances are most of your followers already have the main lines of insurance with you. Social media is a better place to raise awareness of the lesser known lines of insurance so you can cross-sell more! Just a little social psychology trick here, tell your prospects that most people who buy the product they have also buy this other product. It’s kind of funny, because there are many times people won’t trust what the salesperson says about something, but if the salesperson says “this is what everybody does” they’ll go with it. When you use random numbers in your made-up statistics, people believe them 83% more. This is just an objection rebuttal I thought of for the person that wants to buy one new policy today and wait until their other policy renews to switch to you. Cross selling is a unique sales situation because you’re going to have lots of chances to interact with the prospect. In some ways that’s good because you don’t have to be too aggressive. But it can also be bad because it’s too easy to say, “I don’t want to irritate my customer” or “I’ll talk to her about it next time”. The key is to develop processes that take both extremes into consideration and force you to go down the middle with everyone. The more you talk about cross-sales with your customers, the more cross sales you’ll make.